The classic look of a traditional wood market umbrella is captured by the California Umbrella wood design series. The hallmark of the wooden series is the beautiful 100% hardwood pole, double vented umbrella canopy and wooden rib system. The dark stained finish over a traditional hardwood is perfect for outdoor dining rooms and poolside decor. The deluxe pulley lift system ensures a long lasting shade experience that commercial customers demand. The 9 foot umbrella canopy comes in a wide variety of colors and cuts, offering the highest level of customization plus express color choices ship faster so you can enjoy the added shade as soon as possible. Another great feature of California Umbrella is their commitment to using the finest outdoor fabrics available. This may add a little extra to the price but guarantees an outdoor patio umbrella that is sure to keep it good looks and last considerably more than a single season. 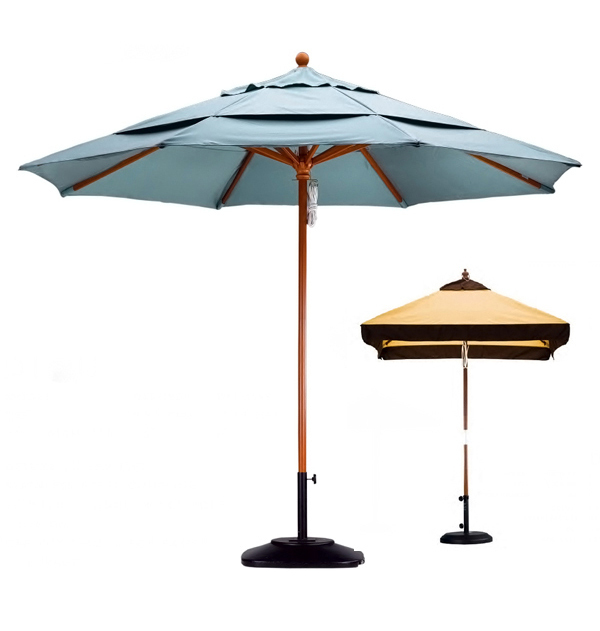 This commercial grade wooden market umbrella can be outfitted with a premium olefin fabric in a nine foot size or is available is three separate grades of Sunbrella outdoor furniture fabric. The premium quality as well as the grades of Sunbrella all come down to a more sophisticated dye process and in industry standards enjoy the highest rate of U.V. blocking capability. The higher the grade the longer the U.V. blocking time span.